When I've had a really crappy day, I usually don't feel like cooking. In fact I don't feel like doing anything more than curl up into a little ball and cry my eyes out. Fortunately I've learned through experience that, while crying your heart out is immensely satisfying, you usually only end up with a stuffy head and red eyes to show for all your efforts. Not a great prospect. Releasing my frustrations in the kitchen however has always led to positive results. The chopping, mixing, frying and tasting seems to have a calming influence on me. Especially when paired with a glass of wine and a listening ear in the guise of TheHusband. So it happened that I was not in the best state of mind when I started cooking this chili. Actually that's putting it mildly. I won't bog you down with the details, but suffice to say, I was not a happy camper. And it might've been due to my fragile emotional state that TheHusband eyed the cacao powder tin I was clutching maniacally next to the simmering meat on the stove with such trepidation. As I've mentioned on numerous previous occasions, I'm a chocolate addi firm lover of all things chocolate. Especially of the Lindt Fleur de Sel persuasion. I'm also a firm lover of mixing it up. Of pairing the unexpected up. With (usually) delicious results. So it stands to reason that I wasn't going to be able to resist a savoury dish with cocoa powder as one of it's flavouring agents. And I won't lie, the cheese on top definitely also swayed me. I am a badge-toting member of the #cheesesluts club after all. I am happy to report though that it turned out swimmingly. That is both my mood and the food. Although I suspect there aren't many things that a comforting bowl of chili con carne won't solve. The cocoa powder lends a depth to the chili that would otherwise be sorely lacking and the spices join together in perfect harmony to create a rich and flavourful meal. And while I can't promise that your sorrows will be a thing of the past, they will definitely be forgotten for a few indulgent moments. Tried-and-tested. 1. Heat oil in a large saucepan over medium-high heat. Add garlic, sauteing for a few seconds, then add red and green bellpeppers. Saute a further 2 - 3 minutes before adding the ground beef. Cook until browned. 2. Now add some flavour to the meat - tomato paste, coriander, all-spice, cinnamon, smoked paprika, chili flakes, cocoa powder, sugar and salt. Cook, stirring for 2 -3 minutes over high heat, then add tinned tomatoes. Stir through, bring to the boil, then reduce heat and allow to simmer, covered, for approximately 10 minutes. 3. Taste and adjust seasonings if needed, then add the rest of the ingredients: butter beans, kidney beans and sweetcorn kernels. Gently heat through, then serve, topped with cheese, your choice of condiments and warm bread. If you can get hold of something like cheese & onion bread I would strongly suggest you get it as it tastes phenomenal with this chili. * If you are unable to find smoked paprika, I would suggest that you substitute with an equal amount of paprika and up the chili flakes to replicate the increased heat from the smoked paprika. ** If you're able to get hold of peppadews, they add a deliciously sweet and tangy edge to the chilli. Just chop finely and serve alongside the rest of the condiments. Why hello beautiful! (Both you, Marisa, and the chili.) This is one gorgeous dish. The photos are beautiful. I'm so sorry you had a bad day but I hope this made you feel somewhat better! 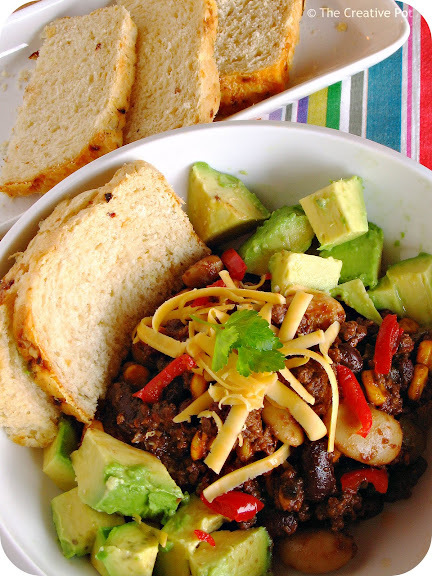 A good bowl of chili con carne can save the day! Yum! Oh yum, this looks really good Marisa. Since I first added chocolate to my chili I haven't look back, I usually add a single block of Lindt 70% to my pot. The taste isn't very obvious but it definitely does add something special. Nicola - Haven't tried adding a square of chocolate yet, but sure it will add even better flavour than the cacao powder! 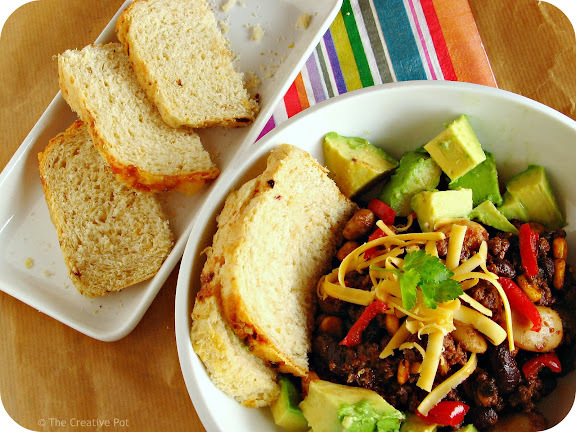 I will try this chili (going make a vegetarian version) especially with cocoa powder. Thanks for visiting my blog, I am happy that at least i was able to make authentic oat meal bars. I love chili! Perfect for a cold night! 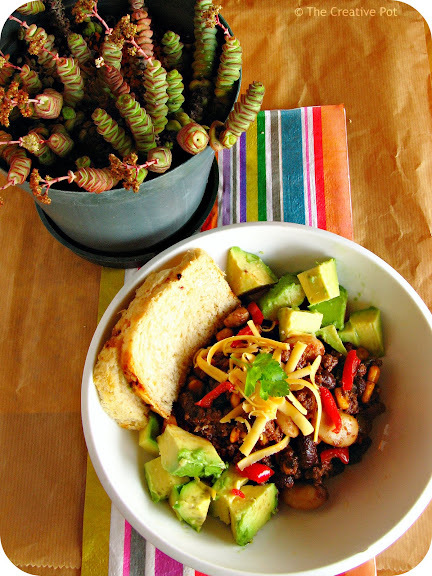 You should really consider submitting this to Recipe4Living's Champion Chili Recipe Contest! It looks delicious!